Now doesn't this look classic and kind off "right". 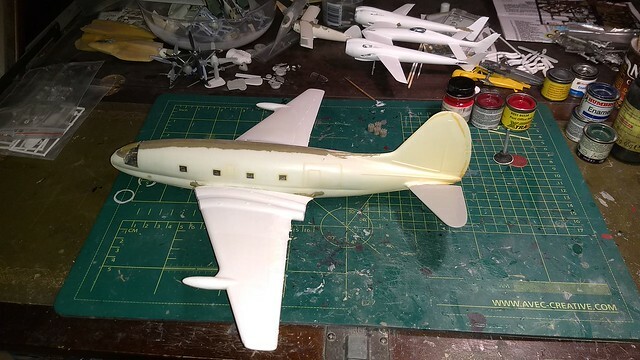 All flying surfaces are just glued on. And soon PSR is starting. 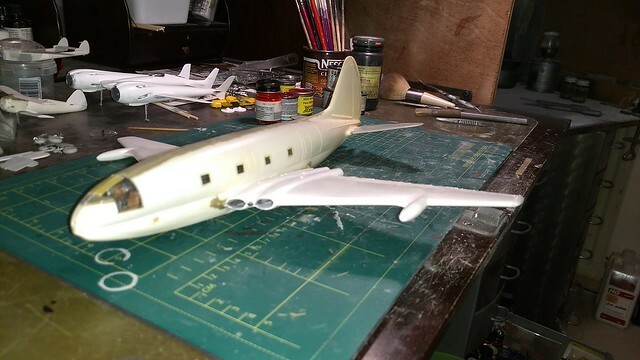 Will finish this in classic Braniff colors and markings. Think I'll keep it as it originally was: a taildragger. Scale and components, please? Did you use the Williams kit? I hope not the ancient vacuform from Sutcliffe/Contrails! Thanks! the fuselage is the Williams bros...assembled ages ago but had some melt spots (aggressive glue?). Comet wings are from an 1/100-ish 4c kit by VEB plasticart. This kit was part of an estate I bought some years ago. It was partly assembled and not fit for resale, so decided to keep it. That looks like it's going to be a a winner! As you say, it looks so....RIGHT! I'd round off the windows though. I like the idea of the classic Braniff colours, would that be the red and blue stripes of various widths along the fuselage? Nice one ! Looks right at home in those wings. Buffalo Joe ! Those wings go good on the C-46 fuselage. What's the fit like on the Commando kit? More to the rear were the trailing edge meets the fuselage meets, the gap changes from 0 to about 6mm over a length of about 5cm. Another thing is the thick trailing edges of the wings. They are about 5 mm at the flaps and ailerons! I'm thinning them down with Dremel and sanding disk. The rear planes come from an Academy B-17 D (I think). Fit is also poor..lots of putty needed! I've V-ed them a little for good measure.. Thanks Dave. I was asking because i've always liked the look of the Commando and would like to build one. I prolly should have been clearer. But it does look "right" I must admit. Great idea - and it looks very good so far.